CLEVELAND — Either you are with us or against us. The age-old adage has been said on numerous occasions and fans can count new Cleveland Browns coach Freddie Kitchens among the believers of that credo, as everything moving forward is directly related to the goal of winning games. “Let’s not fool ourselves, this game is about winning,” Kitchens said in his introductory press conference at FirstEnergy Stadium Monday. “Everything that we do in the organization from the football side of things moving forward, with the organization moving forward, if you do not wear brown and orange, you do not matter. 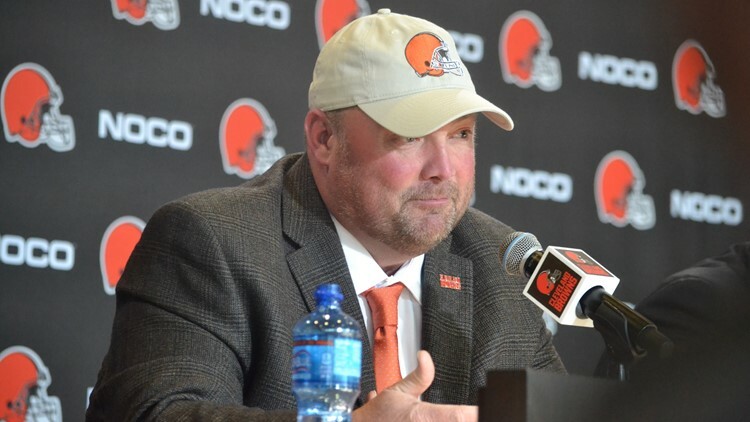 New Cleveland Browns coach Freddie Kitchens says the fun is in winning, and we're going to have a damn good time doing it. By everyone within the organization channeling all of their efforts toward winning, Kitchens believes the culture will continue to change for the better for a franchise with just one playoff appearance (2002) and two winning seasons (2002, 2007) since returning to the National Football League in 1999. “There are ups and downs during the course of a season,” Kitchens said. “There is one thing that has to happen during the course of the season, if you want to get back up from being down and you have to be together. That is not going to change. Within the football team, that is not going to change. From this day forward, it is never changing. 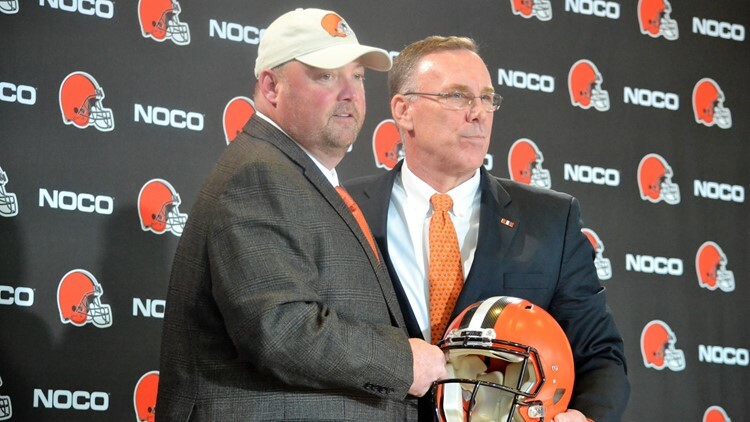 New Cleveland Browns coach Freddie Kitchens (left) and general manager John Dorsey (right) pose for photos after the prior's introductory press conference at FirstEnergy Stadium Monday. But a 5-3 record over the second half of the season and a three-game winning streak in December secured the Browns’ greatest turnaround in team history, as they finished plus-7.5 in wins over their winless campaign in 2017. “We all understand that it was an improvement, but under no circumstances is that ever going to be acceptable,” Kitchens said.